Faith on Friday: Saturday Mornings: MORE Church and Fasting? I should probably begin this post with a confession. I’m slothful. It would be better if I turned that into a repentance, meaning I intend to do something about the slothfulness. Let’s just say I’m working on it. (Here’s a post from 2012 that goes into more detail about my struggle: “Why Does It Have to Be So Damn Hard?”) If you’re tired of hearing me complain about how hard Orthodox Christianity is, please don’t give up on me—I hope to put a positive spin on this post. Why am I focusing on this topic today? 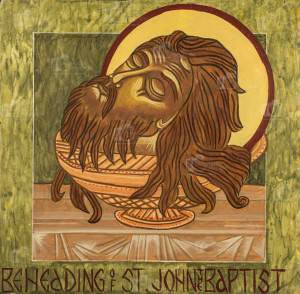 This morning my husband reminded me that tomorrow is the Commemoration of the Beheading of Saint John the Baptist, and we have Liturgy at 9 a.m. And it’s a fast day, in honor of Saint John. And it’s Saturday. Saturday is the only day of the week we can sleep in. 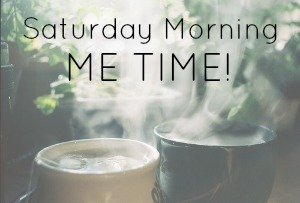 We slow down our pace, enjoy some bacon and eggs, and often spend the morning in our jammies while watching a golf tournament on TV or browsing the newspaper or a good book. 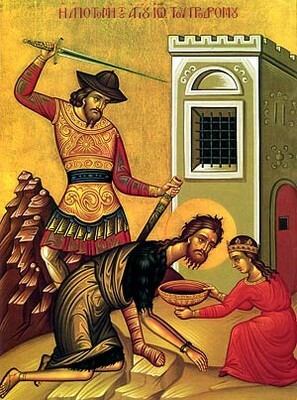 But since tomorrow is the Beheading of St. John, we should be (1) at church and (2) fasting. I should mention that my husband is not slothful. In addition to working full time as a physician, he serves as Associate Pastor at St. John Orthodox Church. And once a month he makes a 130-mile round trip to Grand Junction, Tennessee, at 5 a.m. on Sunday to serve the liturgy at a small skete (monastery) there. He gets home around 2 p.m. But when he told me about the liturgy at church on Saturday morning, he didn’t groan like I did. So today I’m needing to remind myself why the Church asks us to sacrifice our personal time and deny ourselves the foods we love on this particular day. What’s the big deal about Saint John the Baptist? You can read an account of his beheading here. What strikes me as I read this again today is how he was martyred for his politically unpopular stance against Herod’s adultery. He called sin what it was—sin—and for that he was beheaded. Today he would probably just be called out and maybe unfriended on Facebook for taking such an unpopular stand. But it reminded me that being true to your faith can be costly. And so maybe giving up my relaxing Saturday morning and denying myself certain foods for the day isn’t such a big deal in comparison. I’m going to try. And before you go thinking, “isn’t she holy?” or some crap like that, just remember that going to church and fasting are things we do for our souls, because we need God, not because we are godly. Holy Saint John, pray to God for us. Today Herod would have his own reality show. Herodias would probably be invited to “Dancing With the Stars.” When I heard this story as a child, I couldn’t believe the depravity, but nowadays beheadings are modern day terrorist tools for subjugation of the masses. I’m sorry you have to get up early. Bet you’re a little tired from your trip out West to welcome your new grandbaby. I’ll say a prayer for you. Didn’t really get up so early (7:30), Susan… and I’m so glad I went to Church. The pastor’s homily blessed me, as did the connection I felt with the saints. Thanks for reading and commenting. As your very unreligious friend (but spiritual, very) I always enjoy reading your very human commentary. The second of course was to remember John the Baptist, and his moment of doubt while imprisoned, and how Jesus reassured his cousin, and mourned his death. Finally, knowing he was martyred for courageously calling out Herod’s sin but also knowing he was human like the rest of us. Doubting, probably needing a day off sometimes ( 😉 ) yet putting all his faith in his Savior, Jesus. Thank you for sharing this and putting thoughts of him in my heart today. I really appreciate your loyal readership and I always enjoy your comments, Susan.